We are very excited about our newest program that is having such a wonderful impact on hunger in our community. The FRESH! 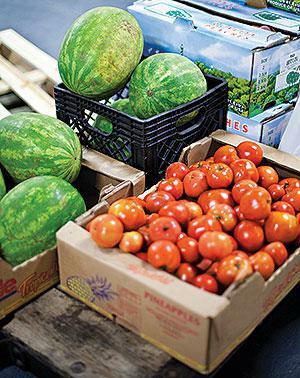 Rescue Program is a collaboration with St. Vincent de Paul Food Pantry & the 10th Ave. S. Albertsons to supply out-of-date fresh food to local pantries & kitchens in Great Falls, MT. Monthly, we are delivering about 7000# of fresh food to local kids pantries - food that would otherwise have been discarded as "waste" and been thrown out. This program is new, and we hope to expand as we find ways to involve both more grocery stores and more recipients. At this time, the Boys & Girls Club (Great Falls and Belt), Mercy Home, Ursuline Pre-school, the Great Falls Children's Receiving Home, and the Juvenile Detention Center are receiving fresh food from the FRESH! Rescue Program. Healthy kids, healthy futures! The most obvious problem with this waste is that while Americans are throwing out their food, an estimated one in every nine people in the world still suffers from chronic hunger—that is, insufficient food—including more than 200 million in Sub-Saharan Africa and more than 500 million Asia. Even in the United States, where that number is significantly lower, some 14 percent of U.S. households still struggled to put food on the table for a portion of last year, according to the USDA. We know that there is more to do. With an estimated 70 billion pounds of food going to waste each year, we must work together to capture more of this valuable resource for the nearly 49 million million people in the United States who feel the effects of food insecurity. When food is disposed in a landfill it rots and becomes a significant source of methane - a potent greenhouse gas with 21 times the global warming potential of carbon dioxide.